Banco Pactual (BTG) from Brazil is the first `Shark` that makes my Davos prediction true. The next generation of structured products, asset-backed by illiquid real estate, is being designed as we speak in the labs of incumbent banks. Reitbz is its name, and is I believe the first security token (STO) backed by a traditional investment bank. $10 for one ReitBz token. No US or Brazilian citizens. You can pay with ETH or USD pegged coined Gemini Dollar. I am excited because this comes from Brazil and not Manhattan or Canary Wharf real estate. Second, because ReitBZ is backed by distressed real estate that BTG Pactual has access to, as they have been a leading investor in Latam real estate for many years. They manage over $2billion and earned the Euromoney award for Best Real Estate investors in 2017 and 2018. Of course, in this phase they will tokenize only $15million worth from their holdings. An Emerging Markets leader in real estate investing, issues, backs and manages the STO. Real estate foreclosures by developers who were denied financing post-construction. Real estate returned by buyers that couldn’t afford a bank loan after construction. ReitBZ is a transparent structure to invest in deal flow that is not accessible easily. The funds raised will not be held by the BTG but by a smart contract on the Ethereum protocol. The management of the investment process (purchase, management of the assets, sale) will be done through Enforce, and entity that is 10yrs old. Blockchain technology reduces the costs of a traditional real estate investment fund substantially (custody, bookkeeping, fund admin, structuring etc). The exact savings, I guess will be reported once the structure is live. What is unclear to me, is whether these savings are higher than the tax benefits that investors enjoy through traditional REIT structures (which undoubtedly have much higher costs in structuring). As the devil is always in the details, keep in mind that on the one hand the funds are kept in the smart contract but on the other hand all decisions are made by BTG/Enforce. They are looking to buy assets at a 30% to 40% discount and over an 18month period, they aim to restructure them and sell them. They estimate that the restructuring process involves 10% to 20% costs. Once the property is sold at a profit, the managers will decide to distribute on a prorated basis the profits via dividends, which will take the form of Airdrops. You can read the white paper and the one pager on their site ReitBZ.io. An oscillation between centralization and decentralization is normal. Market forces will determine the sweet spot. Look at the ReitBZ to realize the structure`s positioning. As in the conventional world, you should always read the covenants. I take this opportunity to highlight the Petro structure which is collateralized by Venezuelan oil resources. The question arises as to how the structure protects the investor to actually be able to access the collateral. Same questions arise for the ReitBZ structure. Real Estate in Brazil, of course, valued and traded in Brazilian Real,…. Cost savings for the investor in complex structures that pool illiquid assets are not that obvious. Again, this is from experience from the financial engineering conventional world. All the setup costs may be lower for digital assets, but what about the fees of BTG/Pactual (seems to me borrowed from the old world much like the crypto hedge funds have done) and what about building in tax efficiencies? The truth is that we will need a few iterations of STO asset-backed structures to figure out how to optimize them. 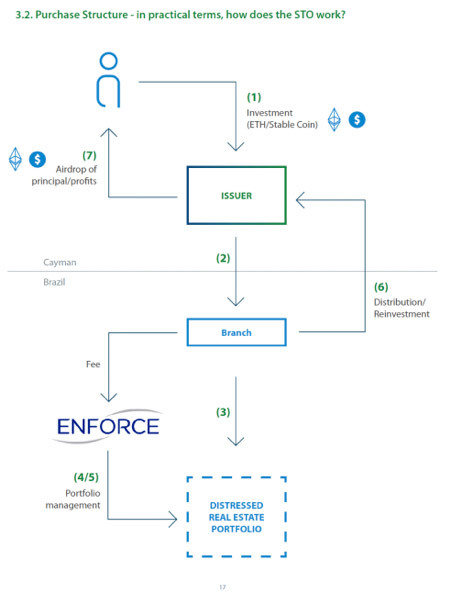 The legal structure is in the Cayman Islands.